one titled “Seby” viewable on the welcome page of this website, which was done in a different technique (acrylics on canvas). 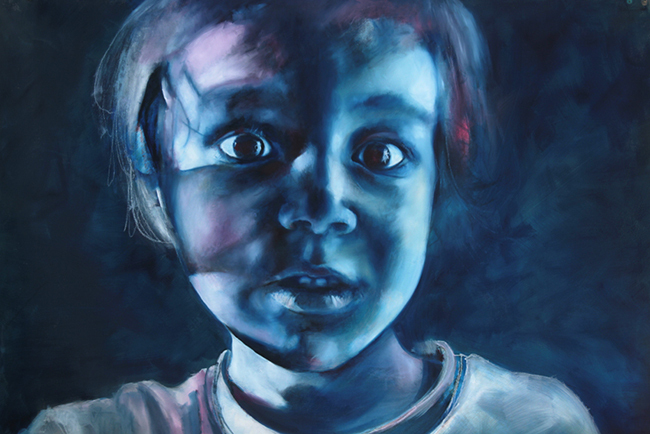 I chose to paint this particular expression of concern on his face in this blue painting, because I wanted to represent fear, uncertainty, and I wanted to catch a moment in which the child, and everybody else around him, were sensing that something unknown, like a dreadful storm, or a sudden cosmic event likely to affect the earth, was about to happen. This painting is about our helplessness, our terror for possible hidden, creepy invasions, and our fear for the future: we can’t at all times predict what is going to happen to us, and often, when we feel weak and exhausted, we can be very pessimistic about our short term fate. A mother, at the time when her child is still very young can often feel very vulnerable, because she feels that the people around her won’t simply understand what it means to be in charge of a human infant, how draining the job can be, and how isolating: an occupation which, in this society of success trough careers, leaves her no time for anything else to do, therefore she has to quit jobs and hobbies alike to become a full time carer. The fast travelling of our actions in this world is not compatible with the slower time of the growth of organic, human as well as and plant, life. But the child brings about a new perspective to the parent: the learning process the child undergoes at school is a stimulus for the carer to learn new things in order to be able to be there for him when he needs help. For example if the child begins to learn a music instrument, the parent can engage in such a learning too, therefore expanding her knowledge, and growing as a better individual who is actually learning from the brilliancy of the tiny, super sensitive creature. Just by helping my son with his everyday music studies, I learnt to read notation, and now I am happily playing an instrument myself. If I didn’t have a child, I would never have been introduced to music, and to the methods available out there to learn it, and I would never have the courage to undertake such an interesting journey with my guitar. I also learnt maths thanks to having to help him in this difficult subject, and I am glad I did: when I was young I was totally convinced that my mind wasn’t capable for this abstract thinking, but I know now that I was wrong, and maths is a language to be learned likewise any spoken language, it is just made of symbols and it deals with calculations and quantities. Returning to the topic of fear, I never overcame it completely, and it is still hunting me, perhaps exorcised in my art, tamed a bit in the blue shades of the painting, but like a black bird waiting and staring at me, never to be understood in its truest sense, and never to be disposed of. Geremiah is a fictional name I used here for my child, to keep his identity private, but I thank him for his skilled, beautiful posture and facial expression he lent to the photograph I took of him before making a transforming painting of it. His scared eyes are the result of pure acting, and deep down the path line of my visual exploration, that stare and enquiring face is my own: my eyes are still at present the expression of a never ending question about life, about pain, about body and mind and their contradictions, about society, and how its events could carry so unknowing and shocking into eternity.